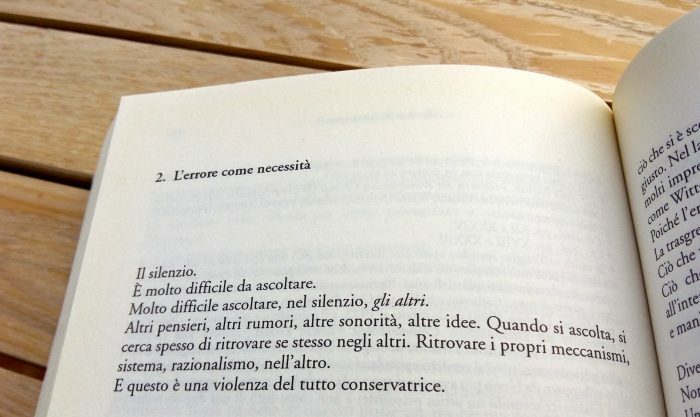 I believe that Luigi Nono’s ideas deserve a new reading, especially in view of recent developments in world politics and the eternal question about how can artists engage with it. It seems to me that Nono’s ideas are often disregarded in today’s English-speaking academia for its ideological alignment, or is it perhaps due to lack of available texts translated into English? Anyway, here’s my humble attempt at translating this beautiful text that has resonated with me for a very long time. I hope friends with access to the original can point to me the many errors that I’ve most certainly made, to help me correct them. I also hope that this encourages further discussion. That’s essential today too. It is very difficult to listen it. Very difficult to listen to others, in silence. Other thoughts, other noises, other sonorities, other ideas. When one listens, often one seeks to find oneself in the others. Finding one’s own mechanisms, system, rationality, in the other. This is a form of utterly conservative violence. Instead of listening to silence, instead of listening to others, one expects to hear oneself once again. It is a repetition that becomes academic, conservative, reactionary. It is a wall against thoughts, against what is not possible –even today– to explain. It is the consequence of a systematic mentality, one based on a priori (inner or external, social or aesthetic). Comfort, repetition, myths are loved; people love to listen always the same, with those little differences that allow to show off their own intelligence. I think that, today, it is a rare phenomenon. The classical concert hall is a horrible space. Because it doesn’t offer possibilities, but just one possibility. For each hall there’s a specific work to do, just like in the past composers wrote for this or that place, for this or that occasion. The music that I’m looking for is written with the space: it is not the same in any space, but operates with it. This allows a great diversity. In the spirit of Musil, if there’s a sense of reality, there must also be a sense of possibility. It’s not correct that if something is chosen it’s unique and adequate; perhaps what has not been chosen is more adequate. In the work in the studio, in electronic music, it is like this. There are many accidents, cases, errors – errors that have a huge importance, as Wittgenstein has theorised. Therefore the error is that, which comes to break the rules. Which goes against established institutions. Which pushes towards other spaces, other skies, other human feelings, internal and external, without a dichotomy between the two, as a banal and manichaeist mentality would still maintain. Not musical formulas, rules or games. A musical thinking that transforms the thinking of musicians, rather than providing them with a new skill that allows them to make so-called contemporary music, a skill that can be used just like a formula. Schoenberg, when he founded his concert society, always imposed many rehearsals. For example, for his Kammersymphonie Op.9 had about ten rehearsals. But didn’t carry on to a concert. This has made me think a lot. The research work is in fact endless. The goal, the realisation, is a different mentality. Perhaps Schoenberg’s idea is not folly, but contains a big truth. Often in the research work, or during the rehearsals, conflicts arise. But those are very emotional moments. Afterwards, there’s the ritual of the concert. Perhaps it is possible to change this ritual, perhaps it is possible to try and waken the ear. Waken the ear, the eyes, human thought, intelligence. The utmost interiority exteriorised. That’s what is essential today.